2 folding blades designed, one on each side of the handle. 1 x Fishing Pliers + 1 x Nylon SheathCOMFORTABLE FEELING: Ergonomically molded comfort grip handles for one handed use. MULTI FUNCTIONS: Can be used as braid cutter, hook remover, split ring remover etc. Perfect for cutting all types of fishing line, such as braided, nanofil, mono, filament, fluorocarbon, fly line, and leader materials. 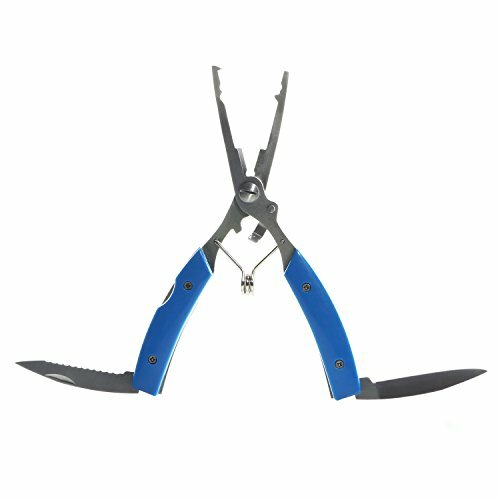 ECO-FRIENDLY MATERIAL: High quality stainless steel fishing pliers for corrosion resistance, long durability and saltwater approval. FEATURES: Lightweight and durable, slim split ring designed, makes hook change quickly and easily.